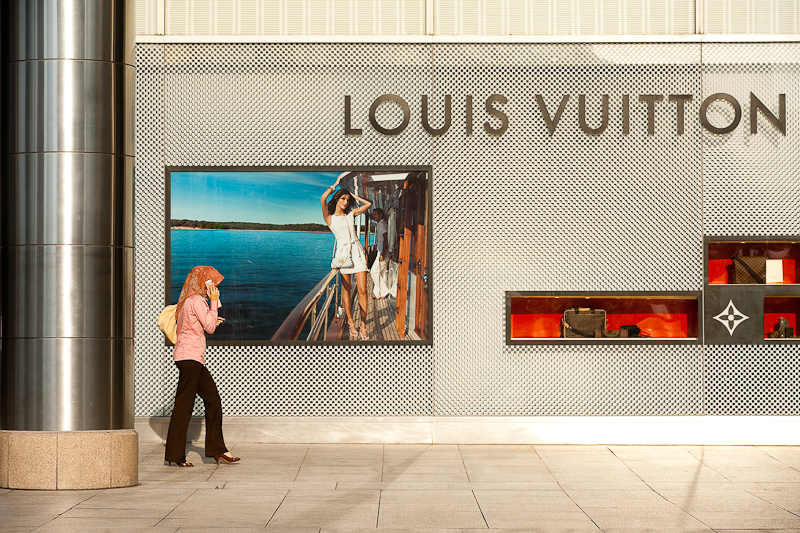 An ethnic Malay woman walks in front of a Louis Vuitton store. Due to British colonization and the habit of importing colonial labor, three distinct ethnic groups form the backbone of Malaysia's diverse population. Here, one member of the indigenous Malay group, who by birth are required to be Muslim as declared by Malaysian law. Mouse over the image for an alternate post-processed version (Flash Required). You are able to view the women walking past the store as if you are actually seeing it for the first time. If you notice in this picture and the two that follow, the women are not looking at the designer dresses in the window of the store. Instead they are carrying on their daily business all in the same city. 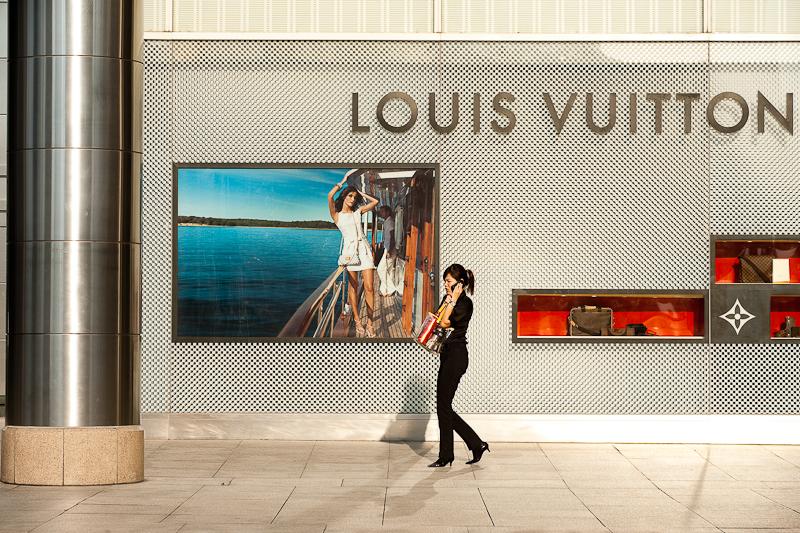 An ethnic Chinese-Malaysian woman walks in front of a Louis Vuitton store. Here an ethnic Chinese woman is dressed rather classy. Although not pictured here, Chinese-Malaysian women often wear more provocative and revealing clothes which stand out in stark contrast when alongside their conservatively dressed Muslim compatriots. 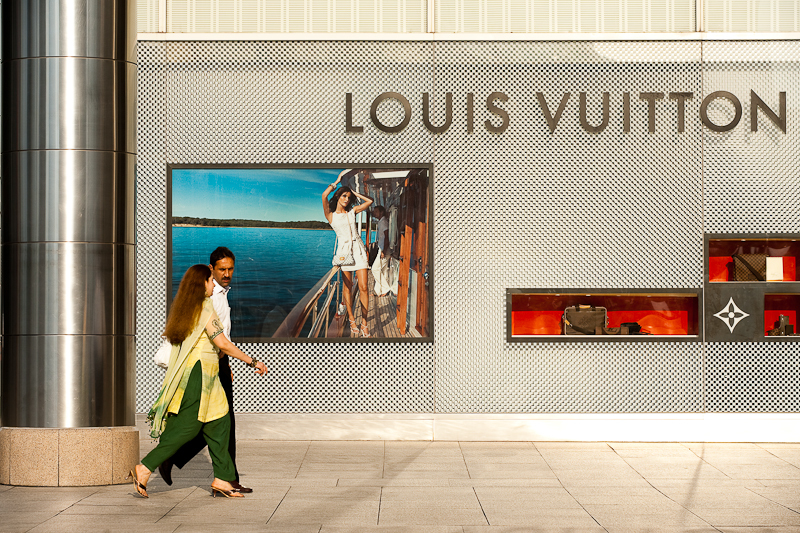 A pair of ethnic Indian-Malaysians walk in front of a Louis Vuitton store. Indian-Malaysians, as a rule, dress as they do in India. Women generally prefer the comfort of a conservative Shalwar Kameez ensemble while men tend to dress more in a manner fitting the West. In terms of personality, it's apparent that the local Chinese and Indians have lost many of their rough old world ways making Kuala Lumpur one of the friendlier capitols in the world. this made me want to moonwalk across the room for some reason.